تکزارع, زهرا, کرمانیان, حسین, رمضانی, امید, رسولی گرمارودی, اسماعیل, عبدالخانی, علی. (1395). تأثیر پیش‌تیمار آب داغ و اسید رقیق بر ویژگی‌های شیمیایی ریشه ‌شیرین بیان. 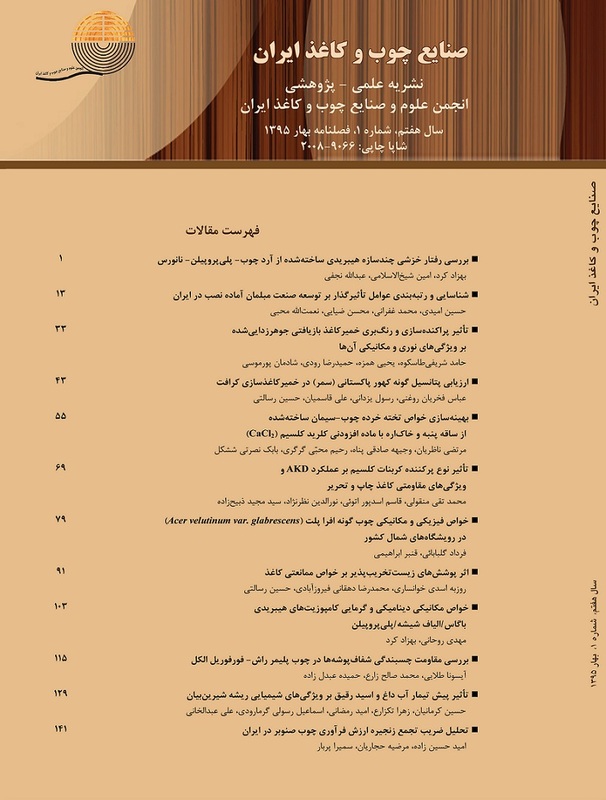 مجله صنایع چوب و کاغذ ایران, 7(1), 129-140. زهرا تکزارع; حسین کرمانیان; امید رمضانی; اسماعیل رسولی گرمارودی; علی عبدالخانی. "تأثیر پیش‌تیمار آب داغ و اسید رقیق بر ویژگی‌های شیمیایی ریشه ‌شیرین بیان". مجله صنایع چوب و کاغذ ایران, 7, 1, 1395, 129-140. تکزارع, زهرا, کرمانیان, حسین, رمضانی, امید, رسولی گرمارودی, اسماعیل, عبدالخانی, علی. (1395). 'تأثیر پیش‌تیمار آب داغ و اسید رقیق بر ویژگی‌های شیمیایی ریشه ‌شیرین بیان', مجله صنایع چوب و کاغذ ایران, 7(1), pp. 129-140. تکزارع, زهرا, کرمانیان, حسین, رمضانی, امید, رسولی گرمارودی, اسماعیل, عبدالخانی, علی. تأثیر پیش‌تیمار آب داغ و اسید رقیق بر ویژگی‌های شیمیایی ریشه ‌شیرین بیان. مجله صنایع چوب و کاغذ ایران, 1395; 7(1): 129-140. در این تحقیق، ابتدا ریشه شیرین‌بیان (Glycyrrhiza glabra) که در یک کارخانه در استان کرمان عصاره‌گیری شده بود، تحت فرایند پیش‏هیدرولیز قرار گرفته و سپس ترکیبات شیمیایی (درصد مواد استخراجی، درصد لیگنین، درصد هولوسلولز)، بازده فرایند هیدرولیز و افت وزنی تفاله آن اندازه‌گیری گردید. عملیات پیش‌هیدرولیز تحت آب داغ، آب داغ و سپس اسید سولفوریک 5/0 درصد و نیز اسید سولفوریک با درصدهای 0/5، 1، 1/5 و 2 درصد بر روی تفاله فوق‏الذکر انجام پذیرفت. نمونه‌ها در آب داغ در دمای 150 درجه سانتی‌گراد و در سه زمان 30، 60 و 90 دقیقه، در ترکیب آب داغ و اسید سولفوریک 0/5 درصد در دمای 150 درجه سانتی‌گراد و در زمان 60 دقیقه و در اسید سولفوریک تنها، در دمای 130 درجه سانتی‌گراد و در زمان 60 دقیقه تحت فرایند پیش‌هیدرولیز قرار گرفتند. نتایج نشان داد در مورد تیمار پیش‌هیدرولیز با آب داغ، زمان 60 دقیقه از نظر بازده، افت وزنی، درصد لیگنین و درصد هولوسلولز از عملکرد مطلوبتری برخوردار بوده است. همچنین در مورد پیش‌هیدرولیز حاوی اسید سولفوریک، سطح اسید 2 درصد گزینه مناسبی به لحاظ حداکثر درصد هولوسلولز و حداقل درصد لیگنین بوده بطوریکه می‌توان این تیمار را برای تولید محصولات با ارزش افزوده بالاتر نظیر بیواتانول از ریشه شیرین‌بیان پیشنهاد داد. Inoue, S.and Yoshimura, T., 2009. Hydrothermal treatment with phosphoric acid for enzymatic saccharification of rice straw. The 6th Biomass-Asia Workshop, 18-19 November, Hiroshima. Endo, T., Tanaka, N., Sakai, M., Teramoto, Y. and Lee, S.H., 2006. Enhancement mechanism of enzymatic saccharification of wood by mechanochemical treatment. In: the Third Biomass-Asia Workshop, 11/15-17, Tokyo and Tsukuba, p. 105. Jatav, V. S. K., Singh, S., Khatri, P. K. and Sharma, A., ­2011. Recent pharmacological trend of Glycyrrhiza glabra linn. International Journal of Pharmaceutical Frontier Research, 1(1): 170- 185. Bolory,-Moghaddam, E. and Hemmati, KH., 2009. The impact of harvest time and the amount of glycyrrhizin in licorice root diameter. Plant Production of Journal, 16 (2): 29-45. Ranaey Siyadat, A., Niknam, K. and Barshan Tashnizi, M., 2011. Cellulase key of energy, Industrial Research and Training Centre of Iran, First Edition, Tehran, 679p. (In Persian). Wood, T. M. and Mccrae, S. i., 1978. The Cellulose of Trichoderma Koningii. Biochemistry Journal, 171: 61-72. Vijai, K. G. and Maria, G. T., 2013. Biofuel technologies, Springer-Verlog, Berlin Heidelberg, 534p. Mosier, N., Wyman, C., Dale, B., Elander, R., Lee, Y. Y., Holtzapple, M. and Ladisch, M., 2005. Features of promising technologies for pretreatment of lignocellulosic biomass. Bioresource Technology, 96(6): 673–686. Taherzade, M. and Karimi, k., 2008. Pretreatment of Lignocellulosic Wastes to Improve Ethanol and Biogass Production. International Journal of Molecular Sciences, 9: 1621- 1651. Sendelius, J., 2005. Steam Pretreatment optimization for Sugarcane Bagass in bioethanol production, M.Sc. thesis, Lund Institute of technology, Lund University, Sweden. Li, S., Li, J., Hu, X., Li, M., Yan, Zh., Li, Sh. and Fan, Ch., 2013. Study on enzymatic saccharification of Suaeda salsa as a new potential feedstock for bio-ethanol production. Journal of the Taiwan Institute of chemical Enjineers, 44 (6): 904-910. Al-dajani., Waleed, W. and Ulrike, W., 2009. Pre-extraction of hemicelluloses and subsequent kraft pulping, Part II: acid and autohydrolysis. TAPPI Journal,8: 30-37. Guo, G.L., Hsu, D.Ch., Chen, W.H., Chen, W. and Hwang, W.S., 2009. Characterization of enzymatic saccharification for acid-pretreatedlignocellulosic materials with different lignin composition. Enzyme and Microbial Technology, 45: 80–87. Ahmed, I. A., Santoso, Sh. P., Tran-Nguyen, Ph. L. H., Ismadji, S. and JU, Y., 2013. Impact of pretreatments on morphology and enzymatic saccharification of shedding bark of Melalenca Leucadendron. Bioresource Technology, 139: 410- 414. Rabbani Esfahani, M., 2010. Compare the types of pretreatment of lignocellulosic biomass to ethanol to natural biological method, 8th Iranian student conference of chemical engineering, technical faculty, Razi University, Kermanshah. (In Persian). Hossein, M. A., 2011. C Investigation on Properties of Soda and Soda/AQ Pulps from Corn Stalk. Journal of Wood & Forest Science and Technology, 18(2): 57-72. (In Persian). Teramoto, Y., Tanaka, N., Lee, S.H. and Endo, T., 2008. Pretreatment of Eucalyptus Wood Chips for Enzymatic Saccharification Using Combined Sulfuric Acid-Free Ethanol Cooking and Ball Milling. Biotechnology and Bioengineering, 99: 75-85. Rasooly Garmaroody, E., 2011. The Effect of Wood Biological Pre-treatment on kraft Pulp and Paper Properties of Hornbeam and Poplar, Ph.D. Thesis, Gorrgan university of Agricultural Sciences and Natural resources. (In Persian). Fooladi, H., 2011. Optimization of Cotton Linter Pulping for α Cellulose production (case study: Parchin chemical industries Co.), Shahid Beheshti University. (In Persian). Wang, W., Yuan, T., Cui, B. and Dai, Y., 2013. Investigating lignin and hemicellulose in white rot fungus-pretreated wood that affect enzymatic hydrolysis. Bioresource Technology, 134: 381–385. Uju Abe, K., Uemura, N., Oshima, T., Goto, M. and Kamiya, N., 2013. Peraceticacid-ionic saccharification of lignocellulosic biomass. Bioresource Technology, 134: 87-94.